As a child in India, C. Mauli Agrawal surrounded himself with Apollo 11 clippings and aerospace memorabilia. Now, he brings that same passion for exploration as chancellor of UMKC. Agrawal comes to UMKC after 15 years at the University of Texas-San Antonio. He is a bioengineer, former auto industry executive, oil painter, inventor and entrepreneur. Agrawal’s father was the first in his family to attend college, and his mother was the first woman in her family to attend college. He grew up in a home with no television, no refrigerator and no air conditioning. He graduated from the Indian Institute of Technology with a bachelor’s degree in technology. Eventually, he decided to make his way to the U.S.
Agrawal went on to earn additional degrees from Clemson University and Duke University, both in mechanical engineering. His research specializes in the area of orthopedic and cardiovascular biomaterials and implants. His mother, Raj, is 87 and lives with Agrawal and his wife, Sue. Mauli and Sue have two children: Ethan, 24, who graduated from Rice University with a degree in chemical engineering, and Serena, 21, a junior at Rice who is studying mechanical engineering. 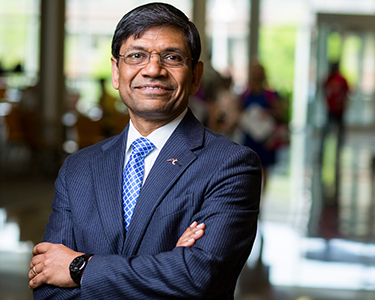 As chancellor, Agrawal’s mission is to make UMKC an even better place to work, study and belong.